This guide assumes an understanding of the normal version of the Twin Valkyr. The Twin Val’kyr fight in Trial of the Grand Crusader is extremely similar to the normal mode, with two major differences. The first difference is that more orbs will spawn during the fight. The second difference, which is just as crucial to pay attention to, is a new debuff cast randomly on raid members, called Touch of Light/Touch of Darkness. Tanks: Two tanks are necessary in this fight. Because the Twins do a great deal of non-physical damage, and are identical outside of the damage they cause, any tank class can tank either Fjola or Eydis. Healers: Two regular healers, plus an off-healer (for a total of three healers.) As explained in the positioning later, this will make sure both tanks and the raid are getting healed. Positioning for Twin Val’kyr, illustrated to the left, is both simple but requires attentiveness on the part of the ranged/healers. The black and white spots on the map indicate the dark and light portals that spawn. As the fight starts, each Val’kyr will be positioned by a portal. Each tank will run forward and tank their Val’kyr next to the portal she spawns by. The map displays the tanks facing the Val’kyr away from the raid; however, they can be faced in any direction. Before the fight is begun, the five DPS must be split between the Light and Dark Val’kyr. Which Val’kyr gets three DPS and which gets two does not matter; however, try to split DPS evenly and with mindfulness to debuffs such as sunders and scorch, so that both Val’kyr are getting fairly debuffed. Melee will stand behind their respective Val’kyr. Ranged will stand to the side or behind the melee. 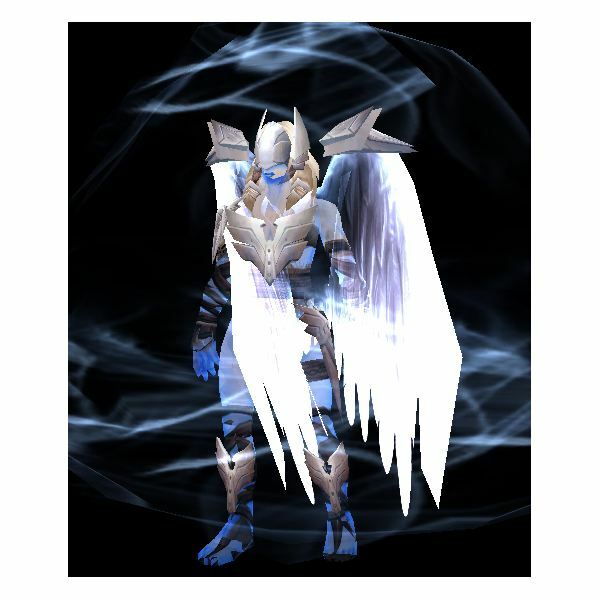 Proximity to Val’kyr is unimportant, but ranged DPS should stand closer to the Val’kyr than the healers. The two healers on each side will possess the opposite color of their tanks and DPS, and will act as soakers as much as possible to absorb opposite color orbs. 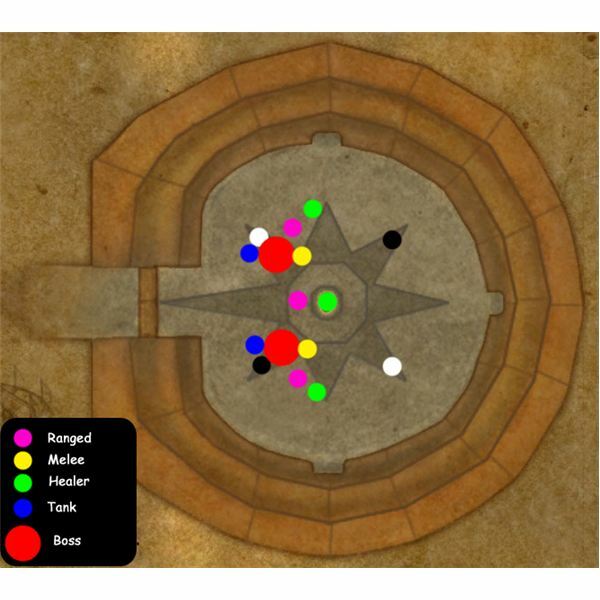 The third, off-healer, should stand in the center and may choose either color so long as he or she is mindful of orbs. All players should be aware of their positioning to the closest opposite-color portal. Before the fight begins, all players must use the correct portal to gain the needed essence for the battle, and prepare by standing on the right side of the room. On the pull, both tanks will head forward and position the Val’kyr, while the remaining players position themselves, healers making sure to stand behind the rest of their group. During the fight, the Twins will randomly debuff raid members with "Touch of Light" or "Touch of Darkness." This debuff will damage players around the debuffed player. It is recommended that players who receive this debuff run to the same color portal as their debuff, touching it to remove the debuff, and then switching back to their appropriate color and raid role. However, it is also possible to heal through the damage so long as three healers are present and players are mindful about orbs. For Light and Dark Vortex, all players should switch to the appropriate color of the Vortex, resume their role, and then switch back to their previous essence when the AoE is done being cast. For Light and Dark Shields, all DPS must switch to the target being shielded. Whichever DPS are switching must first switch essences to aid in quickly bringing down the shield. Once the shield is brought down, the DPS can return to their previous essences and assignments. If DPS is low, preparing to use Heroism/Bloodlust on one shield, followed by cooldowns and speed potions on another, will help make sure the Val’kyr do not heal. With consistency and practice, the Twin Val’kyr become one of the easiest fights in Trial of the Grand Crusader. To see the available loot for Heroic Trial of the Grand Crusader 10-man, check WoWhead’s list.